It looks like the rumors were true after all. Popular aerial lift manufacturer DINOlift has a new distributor for its US, Canadian and Puerto Rican markets. 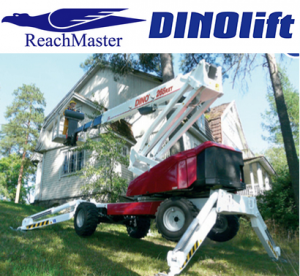 ReachMaster, Inc., (based in Houston, TX) was appointed the preferred DINOlift distributor effective January 1, 2015. DINOlift articulated booms have a strong reputation in the industry as dependable, affordable machines. DINOlift is based in Finland, one of many European manufacturers of high-quality aerial lift equipment. In fact, DINOlift just celebrated its 40 year anniversary of DINO platforms. Most of the DINOlift fleet of industrial machinery is made in their Loimaa based factory. Both American and European-made lifts require the most advanced training possible in order to properly operate these often complex machines. With OSHA regulation updates always coming down the pike, you need to ensure your aerial work platform workers have all the most recent instruction. Just one small safety oversight can result in big fines. Let CertifyMeOnline.net take care of your aerial lift safety program. Unlike other 3rd party solutions, CMO has a passionate, dedicated staff – and we know OSHA inside and out. CMO also offers scissor lift instruction, fall protection and much more. Our contact page includes tons of helpful info, and you can also talk to our aerial lift safety team at (602) 277-0615. Thanks again for reading the CMO blog – we appreciate your feedback, so be sure to drop us a line.